Built-in support for DB2, Derby / JavaDB, Firebird, FrontBase, HSQLDB, Informix, MySQL, OpenBase, Oracle, PostgreSQL, SQLite, SQL Server, Sybase Adaptive Server Enterprise, and Sybase SQL Anywhere. 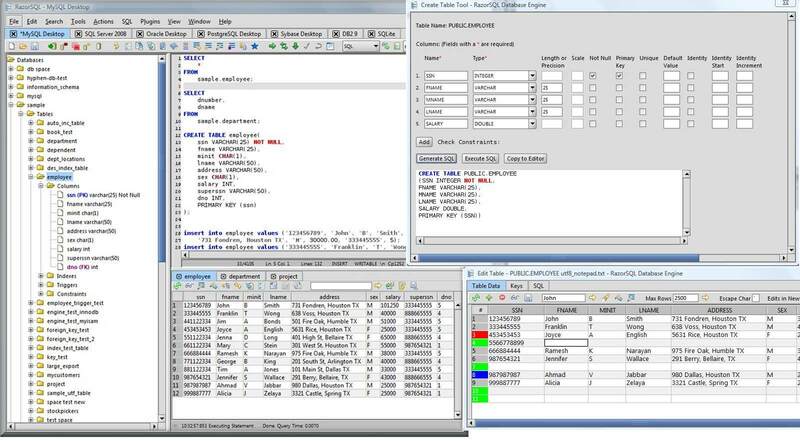 Also can connect to any database that supports JDBC or ODBC (Windows only) such as Access, Daffodil, H2, Ingres, Interbase, Mimer SQL, Mckoi, Paradox, Pervasive, Pointbase, Solid, and Teradata. Generate DDL Tool for generating table, view, and index DDL. Command Line Interface for running RazorSQL tools from the command line. File tools such as head, tail, get section, search / regex search, move, copy, rename, delete, size, and get info. Use RazorSQL provided database specific system queries or user supplied queries for database navigation, or navigate the database structures using the default JDBC/ODBC driver settings. Single click content viewing on tables, views, etc. Column information including column name, keys, data type, nullable information, etc. *Displays information on objects such as procedures, functions, triggers, indexes, constraints, sequences, etc. Single-click generation of DDL for tables, views, and indexes. Search tables and view data. Single-click generation of SQL select, insert, update, and delete queries.